June is full of events in Pisa, including in the conference week the Saint Patron's festivities (San Ranieri) with the Luminara on the night of June 16. This is definitely worth seeing! Book your hotel in advance - highly recommended as hotels will be in short supply. Conference presentations are available in the keynotes and detail of sessions pages. Workshop presentations are available in the workshop page. Conference is now over. Thank you all for the participation. And see you all next year in Vienna for Ada-Europe 2017. Due to unforeseen circumstances, the Wednesday keynote talk will be provided by Guido Ghisio, responsible for Automated Driving Technologies at Magneti Marelli. Ada-Europe proceedings (LNCS 9695) available online at Springer. Early registration cut-off postponed to May 17th. Advance program brochure available in the program overview page. Details of conference sessions available! Tutorials & Workshop information available! This edition of Ada-Europe will feature a focused Special Session on Safe, Predictable Parallel Software Technologies. Following the intensifying trend of usage of Multi-/Many-core systems, it is increasingly important to assess how reliable software technologies need to adapt to these complex platforms, as well as how parallel models need to adapt to domains where safety and predictability is a must. Special topics include (but are not limited to): Predictable Parallel Programming Models, Parallel Language Technologies, Compiler Support for Parallel Execution, Parallel Runtimes and Libraries, Automatic Parallelization, Safety Issues and Reliability Mechanisms for Parallel Execution, Software Modelling and Design Approaches, Hardware Support for Predictability of Parallel Software. For the general track of the conference, topics of interest include but are not limited to Real-Time and Embedded Systems, Mixed-Criticality Systems, Theory and Practice of High-Integrity Systems, Software Architectures, Methods and Techniques for Software Development and Maintenance, Formal Methods, Ada Language and Technologies, Software Quality, Mainstream and Emerging Applications, Experience Reports in Reliable System Development, Experiences with Ada. The proceedings will be published in the Springer Lecture Notes on Computer Science (LNCS) series. Selected papers of the conference will be also invited for special issues of Springer’s Computing Journal (general track papers) and Journal of Parallel Programming (special session papers). Also, a best paper and best presentation award will be presented at the conference. 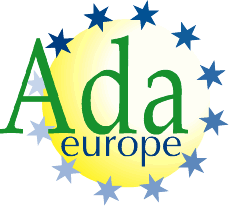 Authors for papers (both the general track and the special session) and industrial presentations shall submit their work via EasyChair at https://easychair.org/conferences/?conf=adaeurope2016. Full details availabe in the Call for Contributions page.